Polar Amplification vs a Godzilla El Nino — Is the Pacific Storm Track Being Shoved North by Arctic Warming? 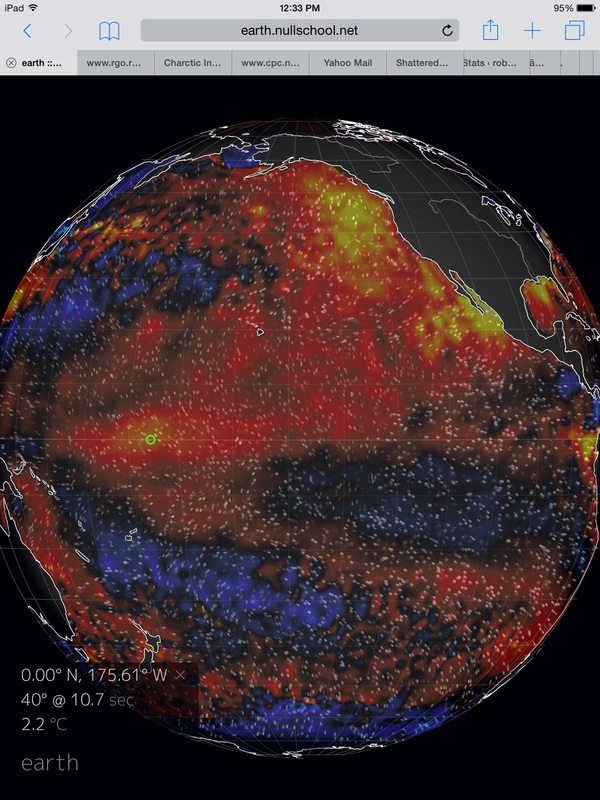 It’s an El Nino year. One of the top three strongest El Ninos on record. The strongest by some NOAA measures. And we are certainly feeling its effects all over the world. From severe droughts in Southeast Asia, Africa, and South America, to Flooding in the Central and Eastern US, Southern Brazil, and India, these impacts, this year and last, have been extreme and wide-ranging. During recent days, Peru and Chile saw enormous ocean waves and high tides swamping coastlines. Record flooding and wave height events for some regions. All impacts related to both this powerful El Nino and the overall influence of human-forced warming by more than 1 C above 1880s temperatures on the whole of the hydrological cycle. Amped up by a global warming related 7 percent increase in atmospheric water vapor (and a related increase in evaporation and precipitation over the Earth’s surface), many of these El Nino related impacts have followed a roughly expected pattern (you can learn more about typical El Nino patterns and links to climate change related forcings in this excellent video by Dr Kevin Trenberth here). However, so far, some of the predicted kinds of events you’d typically see during a strong El Nino have not yet emerged. A circumstance that may also be related to the ongoing human-forced warming of the globe. Particularly, there has been an absence of powerful storms running in over Southern California then surging on into Arizona, New Mexico and West Texas. During strong El Nino events, heat and moisture bleeding off the super-warmed Equator have typically fed powerful storms racing across the Pacific. These storms have tended to engulf the entire US Pacific Coast from San Diego through to Seattle. However, much of the storm energy is often directed further south toward Central and Southern California. These storms tend to run over regions that are typically much drier. So strong El Ninos of the past have often generated abnormal and memorable storms and rains. But this year there has been, mostly, an abscense of such events. Storms have slammed into Northern California, Oregon, been deflected back into the coasts of Canada and Alaska, or even been bottled up near the Aleutian Island Chain. But today, a high pressure cell dominates the western US, warding off a powerful storm system. The storm, howling just south of Alaska and pushing out average 60 foot wave heights and hurricane force winds across the Pacific, is predicted to rebound toward Alaska where it will become bottled up in the Bering sea and push above freezing temperatures into the Arctic Beaufort Sea during Winter. The storms and rains will steer far away from Southern California and even much of California altogether. It’s a pattern more reminiscent of some strange ridiculously resilient ridge (RRR) than that of a strong El Nino. And though storms later this week are again predicted to slam into the Northwest and weekly rainfall totals are expected to rise to near 1 inch for parts of Southern California, the path of these storms and related moisture flows are quite a bit further north than one would expect for a year in which strong El Nino was the dominant feature. The moisture flow, instead, so far has tended northward across the upper and central tiers of the US even as the El Nino related moisture bleed toward the Gulf and East Coasts has remained quite intense. Such observed weather is both contrary to what we’ve tended to know about Strong El Nino and to NOAA’s seasonal forecasts which had predicted much more rain for the southwest than what we’ve seen so far. 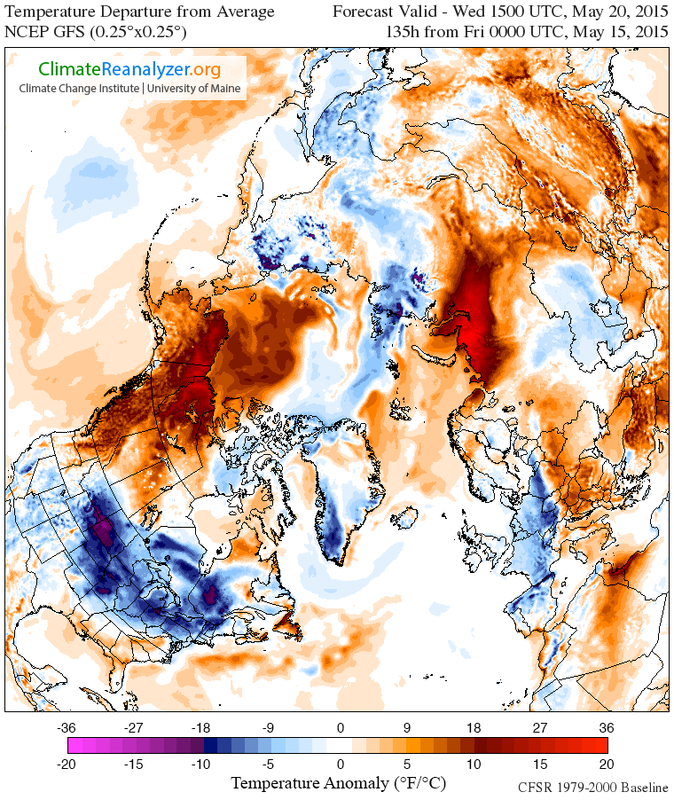 Polar Warming + Hot Blob Tugging the Storm Track Northward? 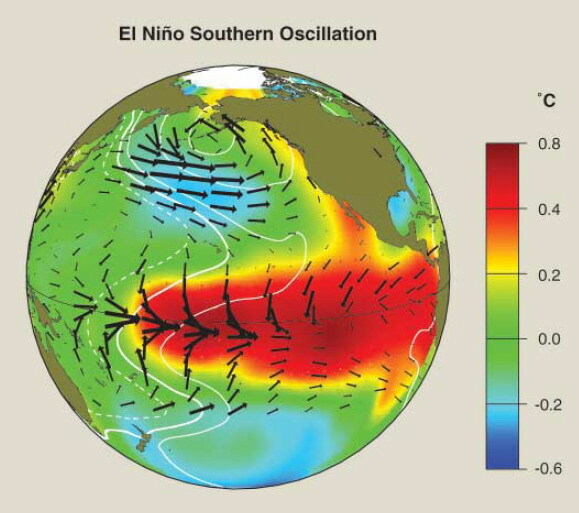 Since weather patterns related to El Nino are an aspect of global atmospheric dynamics — teleconnections between the influence of an excess of hot air and heavy rainfall at the Equator and of large scale atmospheric wave patterns downstream, you have to wonder if there isn’t some kind of influence competing with El Nino on a global scale. One with enough oomph to nudge the Pacific Storm Track northward. The first likely suspect is the pool of still much warmer than normal sea surface temperatures lurking off the US West Coast. Though somewhat diminished from their peak during 2014 and 2015, the waters in the hot blob off California, Oregon, Washington, Canada and Alaska are still in the range of 1 to 3 C above average. A very large region of significantly warmer than normal ocean surfaces that wasn’t present during the 1982-83 and 1997-1998 super El Ninos. And much of the warmest anomalies are now centered much further to the north along the coast of Alaska. But the second potential player is likely even more significant. And that would be an ongoing and extreme warming of the northern polar region. Heating at the Pole generates less thermal gradient between the higher Latitudes and the Equator. And such a lessened gradient would tend to impact the strength of the circumpolar winds that drive weather systems and storm tracks. In particular, the overall warming of the globe would tend to pull these storm tracks northward even as the loss of thermal gradient would tend to enhance wave patterns in the Jet Stream. Perhaps also specifically related to this ongoing polar amplification, we find that two warm slots — one over the Barents and far North Atlantic east of Greenland and another over the Bering — have tended to develop during recent Winter years. These slots have often served as staging areas for warm air invasions of the Arctic. But what they also represent are regions of water that have been freshly liberated from their sea ice coverings. As such, these vast regions of water serve as heat transport and ventilation zones. And all this extra heat energy may be sucking the related North Atlantic and North Pacific Storm tracks into what may well be described as an oceanic and atmospheric trap. If such a situation where the case, we’d tend to see a dipole of warm east, cold west in the storm trap regions. And that’s exactly what we’ve seen more and more of with Greenland and Siberia serving as the backdrops to reinforce this tendency. Thus setting up the stage for cold air slots cutting through Northeast Siberia and Northeast Canada and warm, wet air slots over Alaska and the UK. The question to be asked is, then, are these new influences related to human-forced warming also now doing battle with El Nino for control over the Pacific Storm Track? And has that influence increased enough to dramatically nudge that track northward? We may find the answer to that question in what happens to the direction of powerful Pacific Storms over the next few months. But early indications seem to be that polar warming and the related hot blob may have thrown a wrench in the kinds of El Nino storms that we’ve been used to. What this means, especially when we add in likely record warm global atmospheric temperatures (due to an excessive burning of fossil fuels by human beings) throughout the El Nino event period, is some rather odd, and probably extreme summer weather. For the US, it means an increasing likelihood of heavy precipitation events from the southern plains states through the desert southwest. Storm track intensification through the Pacific to North America means that extreme rainfall events are a distinct possibility for states like Texas, Oklahoma, Colorado, Arizona, Nevada, and New Mexico. California may even see some abnormal summer rainfall, taking a bit of the edge off the current drought. Moving southward, we find drier conditions for equatorial South America and warmer than normal conditions for much of Brazil and Chile. Northern Hemisphere Summer El Nino also enhances the risk of drought throughout Australia, Southeast Asia, and India. In particular, India is vulnerable to monsoonal disruption due to emergence of El Nino during summer time. Enhanced precipitation near the date line also can spur increased cyclone development for the Western Pacific. These sets of atmospheric changes are what we could generally expect from a typical El Nino emerging throughout Northern Hemisphere summer. But we’re not really dealing with normal conditions. We’re dealing with global temperatures in the range of +0.8 degrees C above 20th Century averages and + 1 C above 1880s averages. As such, we should probably look to the margins for potential added impact. Two areas in particular come to mind when considering such outliers. The first region is a zone from Ukraine through to Western Russia. Under added human heat forcing and conditions prevalent during summer El Ninos, this region shows an increased likelihood of drought and heatwave. A vulnerability that became particularly apparent during the El Nino of 2009-2010. Drought conditions are somewhat widespread for that region already this year. In addition, atmospheric high pressure development in this vulnerable area would now, with the enhanced surface warming due to human heat forcing, telegraph into the Arctic through a vulnerable zone near Yamal and the Kara and Laptev Seas. This would particularly enhance snow melt, permafrost thaw, and sea ice melt throughout this region. So with El Nino now a summertime certainty, this broader area certainly bears watching. The second region to look out for is the zone ranging from Northwest Canada through Alaska and on into the Chukchi and Beaufort Seas. Summer El Ninos tend to enhance warming for this region. When adding in an already persistent heating throughout 2015 winter and spring, the area will fall under greatly heightened risk of severe wildfires and extreme and early snow and sea ice melt. Early extreme wildfires in British Columbia combined with rapid sea ice recession already ongoing through the Beaufort and Chukchi may well be indications that such a trend has already asserted. Moving beyond summer, we find a wide range of model consensus estimates showing strong El Nino by fall and winter of this year. NINO 3.4 departures from an average of global model ensembles compiled by Weather Underground hit a value of +1.7 C by September. A level just below the so-called Super El Nino Threshold of +1.8 C.
Should these predicted values emerge, they will literally blow the 1998-1999 Super El Nino out of the water. A monster event to shatter all records. It’s likely that the currently extreme subsurface temperatures due to a very strong warm Kelvin Wave as well as continued powerful west wind back-bursts have kicked these models into freak out mode. And it’s certainly an issue worth keeping an eye on. But it’s also worthwhile to consider that global deep ocean and atmospheric dynamics will push to cool equatorial Pacific waters during September, which would tend to tamp down warming extremes. A factor that many models, which measure the shallow water zone primarily, tend to miss. So, at this point, we have a lock on a weak to moderate El Nino event continuing through this summer. After that time, an unprecedentedly warm Kelvin Wave will do battle with a seasonal tendency for cooling in the Eastern Equatorial Pacific. And if it wins out, we may see something never before recorded in the whole of the Earth Sciences — which would be very bad news for rates of global surface temperature increase this year, along with a huge number of other issues. If not, we likely have a mid ocean El Nino through Fall and Autumn. And that may be bad news for a California desperately in need of drought relief. A powerful Kelvin Wave continued to ripple through the near-surface waters of the Equatorial Pacific this week — heightening sea surface temperatures, strengthening an ongoing El Nino, and pushing a wave of oceanic heat back into a human-warmed atmosphere that is hotter now than at any time in modern human reckoning. Heat that could well make 2015 yet another worsening of the human warming and extreme weather twilight zone we now find ourselves in. According to NOAA’s weekly El Nino report, sea surface temperatures in the critical Nino 3.4 region hit a range of 1 degree C above average last week. A jump from the previous week’s measure of +0.7 C and a new push toward moderately strong El Nino levels off the back of the current warm Kelvin Wave. Atmospheric teleconnections that are signatures of a moderate El Nino also began to emerge over past weeks — with a strengthening of the subtropical Jet and related storm track setting off powerful tornadoes, thunderstorms and heavy rain events in states bordering the Gulf of Mexico over the past ten days. Heat content from the current Kelvin Wave is enough to continue to keep Equatorial Pacific sea surface temperatures in present ranges or to push for further warming over at least the next 1-2 months. A set of factors that will almost certainly lock near moderate El Nino conditions in through Summer and general El Nino conditions through early Autumn. The result is that the extra heat bleed off the Pacific Ocean will combine with the impressive human forcing to generate a high risk that 2015 atmospheric temperatures will beat out all-time record highs set in 2014. NOAA model runs also show a potential for El Nino strengthening through the end of 2015. Probability weighted CFS model ensembles (PDF) point toward a seasonal anomaly for Nino 3.4 in the range of 1998 Super El Nino values at 2.1 degrees Celsius above average by the end of 2015. Mean model runs (non-weighted) push the long range forecast heat values even higher at 2.6 C above seasonal averages or 2.75 C above monthly averages. These unweighted long range forecasts are well outside the strength of even the monster event of nearly two decades ago. A new super El Nino that would have very serious consequences for global temperatures and result in far-reaching climate impacts should it emerge. Atmospheric temperatures that are now in the range of +0.7 C above 20th Century averages and +0.9 C above 1880s values could well push into a new range at +0.8 C and +1 C, or higher, respectively. Entering the range of 1-2 C above 1880s values is a zone of heat anomaly that will amplify already apparent ice sheet melt, sea level rise, droughts, wildfires, water stress, and ocean health impacts. At temperatures around +1.5 C we begin to enter a period of strong glacial outflows, weather instability, geophysical changes, and record related storm events in a ‘Storms of My Grandchildren‘ type scenario. At +2 C these very dangerous impacts will likely be in full swing. It is worth noting that it took 10,000 years to warm the world 4 degrees Celsius at the end of the last ice age. Under current human fossil fuel burning scenarios, it is likely that we reach half that threshold in just 150 to 170 years — from 1880 to 2030-2050. A rapid reduction in fossil fuel emissions along a progression to a net carbon negative human society over the next few decades is absolutely necessary to prevent these outcomes. And while model forecasts indicating the potential for a Super El Nino type event for late 2015 may be somewhat uncertain, there is a much higher certainty that very dangerous climate impacts starting at the current level of human warming will ramp up here on out — with the 1.5 C threshold looking very bad and the 2.0 C threshold looking terrible. As such, we should do all we can to prevent hitting those marks.